This month, we continue our interview series featuring a woman involved in Minnesotan agriculture. Our November 2018 "Women in Ag Feature" is Laura Frerichs. 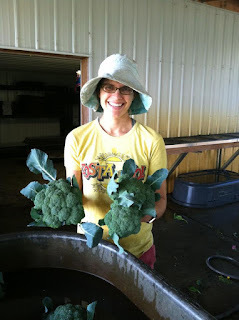 Laura owns an organic vegetable farm with her husband. She operates a 200-member CSA program and supports other marketing channels as well. She explains her journey, struggles, and management techniques needed to become the 40-acre organic vegetable farm she operates today. WAGN: Tell us about your career/farm. Laura: I co-own and operate a 40-acre organic vegetable farm, Loon Organics, in Hutchinson, MN with my husband, Adam Cullip and our two boys, Eli (7) and William (2). I started working on organic vegetable farms after graduating from Grinnell College in Iowa with an anthropology degree. Initially I was attracted to farming to learn more about growing my own food and considered going to work in sustainable development abroad, but thought I should get some farm experience first. At my first farm job, I fell in love with being outdoors, the complexity and challenge of farming, and of course, of eating all this delicious food I helped to grow! I continued to work on five different organic fruit and vegetable farms throughout the U.S. and abroad, and then was offered the opportunity to rent land in an "incubator farm" situation at Gardens of Eagan in Farmington, MN with my partner Adam. We started Loon Organics in 2005 at the incubator farm and rented land for four years there. In 2008, we purchased our current Hutchinson farm and scaled up to start farming full-time. We primarily direct-market all of our produce through a 200-member Community Supported Agriculture (CSA) operation, a stand at the Mill City Farmers Market in Minneapolis, through the Food Group's Harvest for the Hungry program, and to select farm-to-table restaurants and food co-ops. WAGN: What is a professional challenge you've overcome? Laura: After Adam and I started a family, we realized that we needed to be able to step back from the farm and have a more "regular" schedule. We needed more time for our family, for us as a couple, for us as individuals. However, our farm is also very labor-intensive and has full-time seasonal employees that need management. It was a difficult time of questioning what we were doing, why, and if and how we could make the farm work for us. We worked with an outside business consultant/coach, to help us assess the situation and realize that our business was at the point where we could no longer do it all. In 2014, we decided to advertise and hire a farm manager so that we could delegate more of the day-to-day responsibilities and employee management of the farm to someone else. This freed Adam and I up to do higher-level tasks on the farm, give us breathing room to take a summer family vacation, and be involved in other professional and personal projects, if desired. We raised prices of our product, explaining to customers the rationale behind needing to be able to pay higher wages in order to attract high quality management and staff. We have had a farm manager since 2014, and it has been a great decision to help our farm systematize, streamline, and not place the entire burden of running the farm on us as farm owners. WAGN: Agriculture and family business can be difficult, what are some successes you've had that help you to keep positive? Laura: We've been very intentional and aware that this is a difficult, stressful profession, and that the family business aspect adds another layer of complexity and stress. Being really intentional about good communication and trying to keep the farm's challenges separate from our family life helps to set up some healthy boundaries. Every year we evaluate what is and is not working for us on the farm, and make small changes to improve things. Changes can range from buying a piece of equipment to increase harvesting efficiency and quality of life to implementing weekly individual "self-care" time for each of us that is on the calendar. Our partner helps us to make that happen by watching the kids. The changes help us feel more in control of what we are doing; that we can change things that are not working for us, and that we are in charge - not the farm. Having weekly farm meetings for Adam and I, monthly staff meetings with our employees, and as-needed one-on-one employee check-ins has helped us maintain good communication, an open work environment, and have everyone be on the same page. It's hard to make time for that sometimes, but when we don't , it certainly shows. On a personal level, when I have a hard day, I come back to my "Why?" question to help remind me why I am doing this and the motivation behind it. I feel really lucky to be able to nourish my family and community with good food, and to take good care of a beautiful piece of the Earth. It helps puts things in perspective when everything else seems to be going wrong. WAGN: What is something you'd like to share with other Minnesotan women in agriculture? Laura: This is a hard profession and isolating at times, as we are all on our own farms, usually in rural areas. Many of our neighbors are no longer farm operators so I have to reach further out of my neighborhood to find farmer colleagues and support. For this reason, I appreciate having employees on our farm, not only to help us with our farm work, but also to help make my job more social and fun. The majority of applicants and employees that we have on our organic vegetable farm are women. It's really remarkable to see the overwhelming interest in small-scale sustainable agriculture come from women. I'm excited about the possibilities and future of agriculture in Minnesota and that it can have a more diverse face going forward. Let's do everything we can to support all those interested in pursuing careers in agriculture, including women, immigrants, and people of color that typically are underrepresented in our industry. This is where the energy is coming from and I think it is so exciting to see. Having more people involved with agriculture, living in rural areas and managing farms will help create the vibrant rural communities that we all want and need right now. WAGN: What have you learned from other women in agriculture? Laura: Almost everything I know! I've worked for some incredible women farmers, along with some great male farmers as well. However, I feel a special bond and closeness from other women in agriculture, especially other mothers, which can be mentors, educators, supporters, cheerleaders and commiserators. Thanks to those that have blazed a trail before me, and to those that have been honest and vulnerable about their struggles with farming and farming with family. Shining a light on these issues helps us all feel less alone and more supported to get up and do this important work every day.